How are you celebrating National Poetry Month? There are so many ways, but one way is to simply read more poetry! (That sounds easy enough, right?) I am once again participating in The Big Poetry Giveway! See my website to sign up! I am officially blogging at my new website. Here is the direct link to my blog — please join me there! I will be updating the general website as the new year moves along. April is coming to a close. I have just a few more classes of the semester and then I am facing the summer — with lots of projects and tasks I should complete. Yet, in light of the events that have happened this past month, I’m finding it hard to get excited about the months ahead. It’s funny — but everyone thinks that if you are a writer, then of course, writing about your grief helps you find some relief and closure. But I’ve always had trouble writing about personal loss — at least right away. So for now, I’m wrapping up the semester, and I do have a “To Do” list that NEEDS to get done, no matter what. I also have a lawn that needs to be mowed (yes, the neighbors with their rumbling lawnmowers make me feel guilty). I have boxes of book left over from spring cleaning that need to be donated. I have laundry. I have dusty window blinds. I have dishes in the sink. I have one last lesson that needs work. The business of living must continue. Today, Anthony and I lost our beloved cat, Lola, after she fought long and hard to overcome chylothorax. She was only three years old. 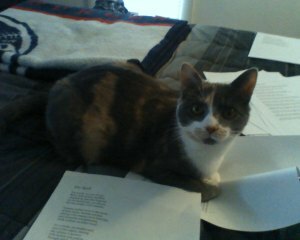 I have posted my favorite picture of Lola, where she is helping me with my manuscript. She was right. That is what it does feel like. Spring has arrived just in time! (So says the poet blogger rather sarcastically). I’m back to the classroom tomorrow and looking forward to the whirlwind of April events, including JCC’s celebration of Earth Month. The temperatures have warmed up, and the cats (Lola is holding her own.) are enjoying open windows and the outside drama of birds and bunnies and chipmunks. Yes, it’s supposed to rain later today, but I will take the warm April showers, instead of frost and snow. T.S. Eliot was right. April is “the cruellest month.” Dear Scrapper Poet readers, Anthony and I have found out that our beloved kitty Lola has been diagnosed with a rare condition called Chylothorax, which is basically a build up of lymph fluid in the chest cavity. The prognosis is guarded to good. Right now, she seems to be fine — she’s eating and playing and is very alert. She has some respiratory problems, but is managing. We are treating her with medication and a new diet that is low in fat. She had a chest tap last week, and yesterday, a follow-up visit to the vet, who was pleased with her progress. I know that this type of medication often takes weeks before we see any results. I also know that this condition is often fatal to cats, but I also know that many cats heal and live good, healthy lives. So please think of Lola in our little humble household of cat lovers. Today, when I received a note in my inbox from the New England Review mourning the loss of Jake Adam York, I couldn’t believe it. I just couldn’t. I searched the Internet for confirmation hoping that it was one of those cruel hoaxes. But it’s not a hoax. It’s true. Still, when people would ask me who I thought was the best contemporary poet writing today, Jake would always be one of the first names I would mention. While Murder Ballads is still my favorite book of his, I loved his other collections as well. He approached the culture of the American South, in all its flawed yet in many ways, beautiful history, with a thoughtful, lyrical voice. His poem, “Elegy for James Knox” is one of my favorites, and a work I return to again and again. I never met Jake in person. He was one of those poets I admired from afar. And lately, because I have been thinking a lot of the next life — where ever or whatever that may be, I do hope that somehow we will meet. I woke up to a dark and gray day, much like yesterday. No, it’s not the weather. It’s not the Holiday Blues. It’s not even because I’m buried in final grading. Like the rest of the nation, I am mourning over the victims in the recent Connecticut School shooting. There’s really nothing to say that will help those who lost family members in this tragedy. We can talk politics and gun control laws and religion, and everything else that has come up in the news when I tried to wade through the various reports to piece together what really happened. But, I’m not sure if that is where the healing will begin. I need to clarify this last statement honestly. I don’t know how the healing really should begin. Still, although this act will not bring the victims back to their families, this article made me smile, just a little, today.